It’s getting hotter and summertime activities are getting into full swing. Take advantage of the longer days by doing gardening tasks in the morning or evening when it is more pleasant to be outside. Hotter weather means grass will be growing faster. Keep up with the mowing so you don’t have to bag the clippings. That may mean mowing every 5 or 6 days instead of every 7 to 10 days. Letting the clippings fall back into the lawn recycles nutrients but does not promote thatch. Mowing frequently at the correct height will promote a healthy, thick turf that is resistant to weeds. As spring rains slack off and give way to drier days, apply supplemental water as needed. The rule of thumb is to water enough to wet the soil 5 to 6 inches deep. Do not water too frequently. Shallow, frequent watering promotes a shallow root system that is more susceptible to the stress of summer heat and winter cold. The best way to conserve moisture in the landscape is by mulching. A 3 to 4 inch layer over the root zone retains moisture, keeps the soil cooler and helps prevent weed seeds from germinating under your shrubs, trees and flowers. June is a great month for colorful summer annuals. In a sunny location try marigolds, salvia, petunias, dusty miller, and lantana just to name a few. Caladiums, coleus, impatiens and bedding begonias are a good choice for shady areas. Summer tropical plants, though they are not freeze hardy, are perfectly at home in our Texas heat and humidity. Plant them in the ground for quick growth or in pots or tubs so you can overwinter them indoors. How is your garden doing? 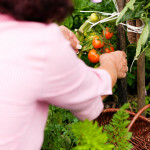 Tomatoes, onions, potatoes, green beans, squash, and others should be ready for harvest. Your summer recipes should be full swing. This entry was posted on Monday, May 14th, 2018 at 12:44 pm	and is filed under Garden, Lawn & Garden, News & Updates. You can follow any responses to this entry through the RSS 2.0 feed. Both comments and pings are currently closed.